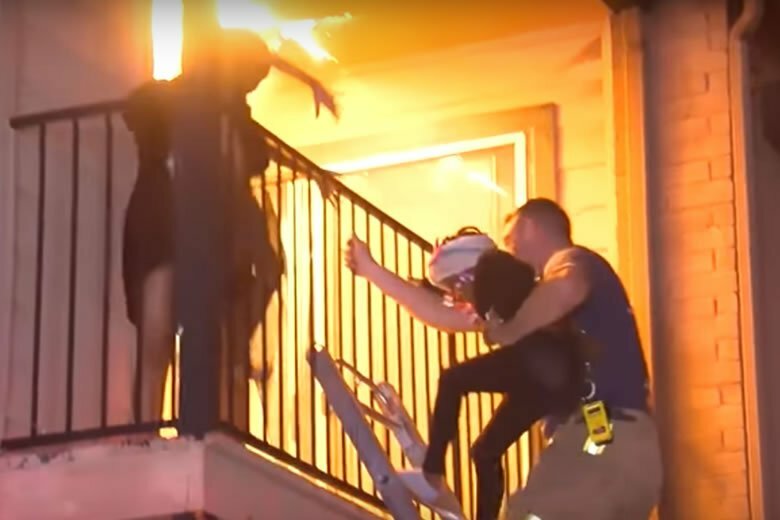 Firefighters Rescue Family of three children and a woman were from a fast-moving apartment fire in Houston, Texas. The fire started in building nine of the Cornerstone Village Apartments around 1:30 a.m. Monday. It quickly spread to three alarms but Firefighters were able to rescue a woman and her children from a second-floor window. This incredible video captured the family being brought down a ladder from a back balcony while the flames raged behind them. Just before 4 a.m., a puppy was also rescued from the building and one building collapsed because of the fire damage and is a total loss. A cause is not known at this time.